Britten Sinfonia is one of the world’s most celebrated and pioneering ensembles. The orchestra is acclaimed for its virtuoso musicianship, an inspired approach to concert programming which makes bold, intelligent connections across 400 years of repertoire, and a versatility that is second to none. Britten Sinfonia breaks the mould by not having a principal conductor or director, instead choosing to collaborate with a range of the finest international guest artists from across the musical spectrum, resulting in performances of rare insight and energy. On Monday 5 March at The Apex, pianist Jeremy Denk and Britten Sinfonia will perform a rhapsody of jazz and dance inspired music by Gershwin and Stravinsky. From its opening clarinet glissando Gershwin’s Rhapsody in Blue has become synonymous with 1920s America and its popularity continues to this day. Performed in the original jazz band arrangement with acclaimed pianist Jeremy Denk, the work is paired with Stravinsky’s rhythmically complex Concerto for piano and wind and Milhaud’s jazz infused La crèation du monde. The Britten Sinfonia play at The Apex on Monday 5 March at 7.30pm. Tickets are £26 & £19, with £5 tickets for those aged under 25. 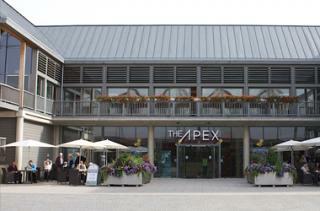 Ring the box office on 01284 758000 or see the website - www.theapex.co.uk for details. Serving home-made american inspired food including burgers, ribs and bar nibbles in an atmospheric industrial style setting.